You got to ask yourself; Do I Feel Lucky? It is no longer enough to expect that the Second Amendment ("... shall not be infringed ...") is sufficient to protect a citizen from prosecution by overly zealous local politicians; now even laws which are not constitutional are being used to prosecute those whose career is based on enforcing the law. What was that old song? "I fought The Law, and The Law Won!" ... if the officer wanted to own an AR15 (he should have known it was illegals), he should have moved to Oregon where it's still legal to won an AR15. So far. We should have all seen this coming. New York, California, Chicago, etc. ... all have draconian (and extra-constitutional) anti-gun laws, and The Supreme Court has not weighed in on many of them. Certainly this Law Enforcement Officer knew what the local laws were, and he deliberately decided to ignore them. At best, he made a decision to challenge the local (state) laws, and offer himself as a test case against their constitutionality. It's difficult to believe that he expected to "get away with it". I hope that was the purpose; I hope he fights like hell for his Constitutional Rights, and wins. Sounds expensive; I don't expect him to get away without jail-time. He will certainly be fired from his job. I have no recommendations. I don't think he's going to be employable in the state of Californai, and if he's convicted, he'll never be employable as a 'serving officer' in this country. Officer Abrahamsen knew what he was doing ("Test Case", or else he's an idiot, which I doubt) so we can count on a very interesting court case. Which he will lose. Or he will ... eventually .. win in appeals to a higher court (which I doubt) and we will hail him as a hero of the Second Amendment. 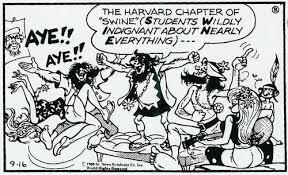 Sometime back in the sixties, Al Capp (he of the "Lil' Abner" cartoon fame) 'invented' an organization which he labelled "S.W.I.N.E." (Students Wildly Indignant About Nearly Everything) to parody student protests about ... well, nearly everything. I so wish Al were still alive. He would have loved this! About 30 members and supporters of the newly formed D.C. chapter of Gays Against Guns assembled on Connecticut Avenue outside the Marriott Wardman Park Hotel in Northwest Washington on Tuesday to protest a conference organized by the National Shooting Sports Foundation or NSSF. Organizers of the protest said their aim was to “out” the little known foundation, which they say portrays itself as an advocate for hunters and outdoor sports enthusiasts but in reality is the national trade association for gun manufacturers, gun dealers and gun show operators. 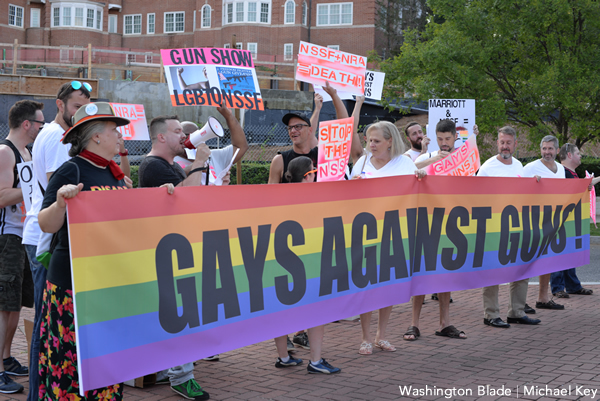 “They have just as much influence on Capitol Hill as the NRA, but few voters even know who they are, the harm they do to the public, or which members of Congress they control,” said D.C. Gays Against Guns co-founder Michael Adolph. Wow! I'm flabbergasted. The NSSF is a closet organization that really represents the firearms industry. Who knew? Other than anybody that knows anything about the industry. What do you do when confronted by an angry mob, and you're armed? Is this a 'no win' situation? Sources are limited, permissions to repost some of the references are refused. You'll have to do the groundwork for yourselves, but be sure to visit the Victoria Taft connection. also see the Washington Times write-up. Europe is considering a 'tracking system' to vet ... and follow ... every individual crossing its borders. The intent? Watch the movie. Walls and wire fences are not all that's being built at Europe's borders. The European Commission and Security Companies dream of "smart borders": a multitude of automated and interconnected files and control apparatuses able to follow each individual. The program's objective? Counter-terrorism and keeping migrants out. But these structures -- the effectiveness of which remains to be demonstrated -- risk straining public finances, while threatening civil liberties and private life, should some states decide to pass from border control of each person to surveillance of everybody. However, as reported by the Lake Oswego Review, Lucas may have broken the state’s new and confusing expanded background check law by asking a parishioner to store the gun while he arranged its transformation into a art object without first going through a mandated check. Under the new law, all private gun transfers must take place through licensed firearms dealers who would perform background checks. There are some narrow exceptions for family transfers, brief loans at shooting ranges, law enforcement, and – in some cases – inherited firearms, but disregarding these, all others must go through a dealer. I don't agree with Rev. Lucas, but I applaud his dedication to a goal which seems useful to him. And I'm disappointed that Oregon's new firearms laws may make him only the latest victim. The laws require that transfers from one person to another go through a licensed dealer; the reverend did not know nor understand these laws. He thought that if in good faith he found someone to hold the rifle while he managed to find a way to dispose of it (for the benefit of others), he was doing A Good Thing. Spending $3,000 on a raffle, for the sole purpose of 'getting it off the streets', may seem naive to some of us. (Well, it seems so to me.) I accept that his intent was noble. Last updated August 27, 2015 . In 2015, Oregon enacted a law requiring a private or unlicensed firearm seller to conduct a background check on a private or unlicensed purchaser before transferring a firearm him or her.1 The transfer must be conducted through a federally licensed firearm dealer (FFL). The FFL must process the transaction as if the dealer were selling the firearm from his or her own inventory and comply with all federal and state laws regulating firearms dealers (See the Oregon Background Checks and Federal Law on Private Sales sections for further details). IF the "Parishioner" was not a FFL, the good Reverend has clearly violated the law ... however inadvertently. Will the State of Oregon prosecute him for this act of do-gooder-ism?? If justice is to be served ... no. However, the State Must Be Served, and laws do not allow for 'ignorance as an excuse'. Which means that Reverend Lucas had no intent to violate the law; but rather, his intent was to avoid having an Evil Gun enter the community. This is a classic example of state legislators creating a law for no valid reason other than to show that they are 'doing something' during their tenure. 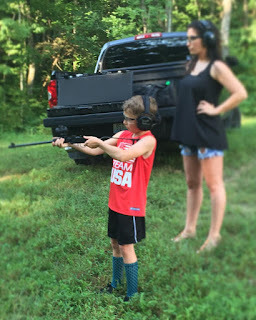 I love it when a mom teaches her child 'gun safety'. Afternoon activity. 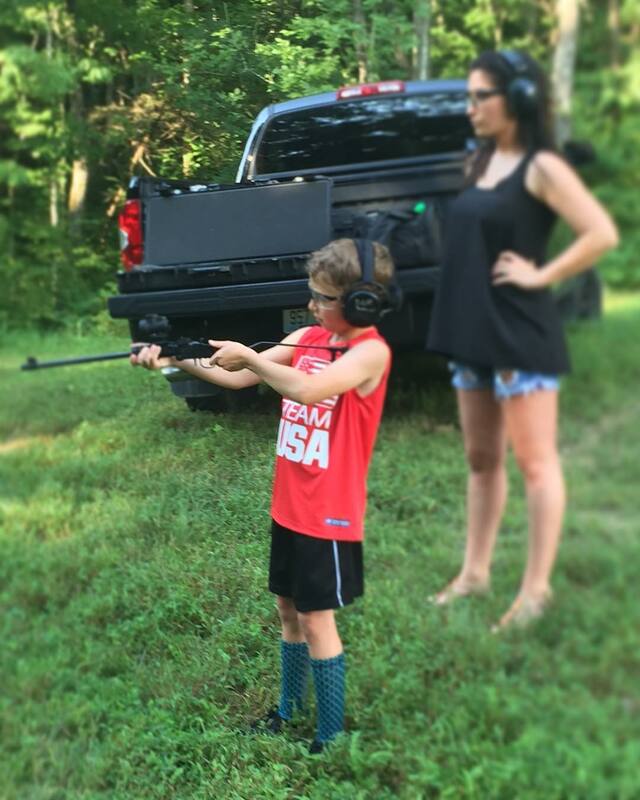 Bristol Palin is raising eyebrows after she shared a photo of her 7-year-old son, Tripp, shooting a gun. The newly married mom of two, 25, posted a snapshot from their outing via Instagram on Friday, July 29. "#trapper #safetyfirst #teachingthemyoung," she wrote. In the pic, the mother-son duo are both wearing headphones and goggles. Palin stands behind her son while he points a gun near a wooded area. Chico Tillmon remembers the first time he saw a dead man. "I was eight years old, and my mum had sent me to the mailbox. As I approached, I saw a guy being robbed for his Boombox. And the guy was killed right in front of me. I saw a man lying next to the mailbox dead." It wasn't his last. Between when he was 17 and 22, nearly 50 of his friends were shot and killed. "At some point," he says, "it became normal." Chico's story isn't unusual in his community of Austin, one of Chicago's predominantly African-American, low-income neighbourhoods. Like his peers, after a childhood spent witnessing violence, he became a perpetrator of it himself. He went on to spend 16 years in federal prison for gang-related activity. At first I thought: it's ironic that Al Jazeera is criticizing America for it's gun violence. Hillary Clinton tells Fox News Sunday she is “not looking to repeal the Second Amendment,” but she does intend to regulate it. President Obama has just signed a new executive order that will essentially put a majority of small gunsmiths and niche gun parts makers out of business. Essentially, the new regulations mean that small gunsmiths who fabricate or modify parts of any kind could be labeled as manufacturers under current ITAR regulations. Gunsmiths (licensed) who violate this 'executive order' are (apparently, I'm just guessing at this point) subject to fines rather than imprisonment, because this is an "Executive Order" rather than a "LAW"... but the information is not immediately available. This is typical of Liberals Obama, having no need for either the Legislative branch (you know, the folks who are expected to make laws) or even the Judicial branch (those who try violators of laws and impose sentences).